Your supervisors are where the rubber meets the road for ensuring wage and hour law compliance. What they don’t know could hurt you—which could be a lot! Don’t risk the chance that an isolated misstep, or misinformation, could land you in court. Regulations, which vary from state to state and across municipalities, are constantly changing and can be very complex. 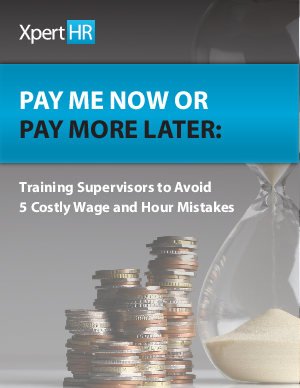 You play a critical role in ensuring that front-line managers and supervisors have the information, knowledge and support they need to ensure wage and hour compliance. But, chances are, you’re also challenged to stay on top of an ever-shifting wage and hour compliance landscape. We can help. Get the up-to-date information you—and your supervisors—need to know now, by downloading this free whitepaper from XpertHR.